It was a big night for our family – the night we finally showed the world we were deserving of respect. We were tired of Al Mansky (the richest mobster in the country) getting all the glory – and hogging all the loot. Al was out of town, and had left all his loot stashed in his mansion. No guards, no cops – the perfect opportunity. You remember when I did you that favor? Because of the thing? Back in Poughkeepsie? That’s why you oughtta do me a favor now! We better get everything we can before Mansky gets back! 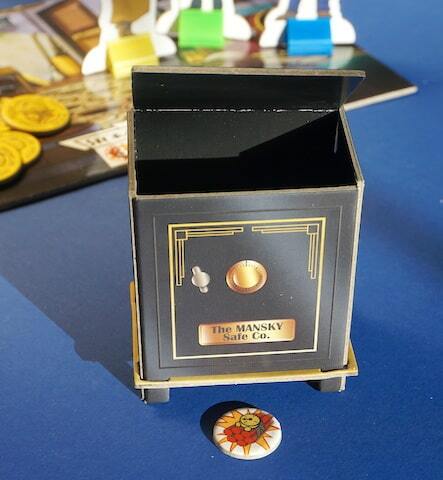 tropes drive the narrative of a new game from Calliope Games called The Mansky Caper. 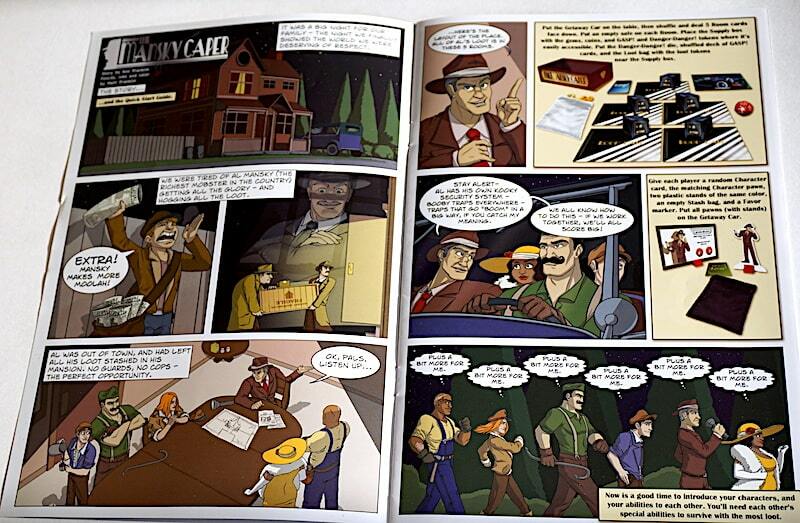 A labor of love from Ken Franklin and illustrated by his son Matt, The Mansky Caper has been in development for eight years. 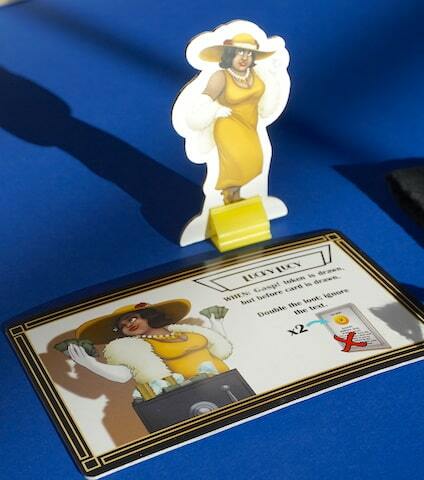 In this luck-based resource gathering game, you play as a member of a crime family, taking advantage of mob boss Al Mansky while he’s out of town. You and your fellow gangster thugs set forth on the caper of a lifetime, mobbing the all-powerful Mansky blind! Explore the house, scour the rooms for treasure, and escape. Your success is based on working together, but maybe not too much. You do want to get the most for yourself, after all. The locations in The Mansky Caper are represented by large 6”x9” boards. To set up the table for play lay out five random Room boards face down. Place the Getaway Car near the house. Put an empty Safe on each Room. 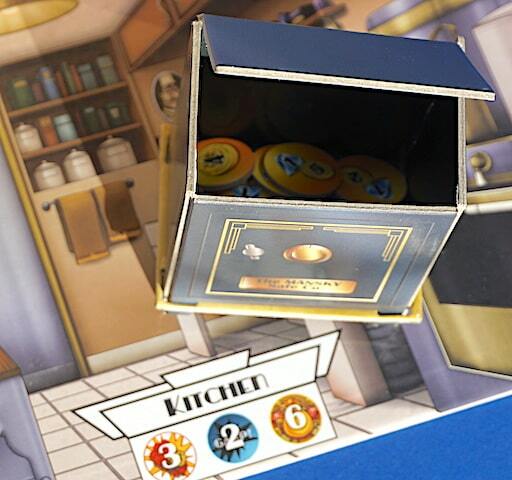 Place the Supply box with the gems, coins, and GASP! and Danger-Danger! Tokens where it’s easily accessible. Put the Danger-Danger! Die, shuffled deck of GASP! cards, and the Loot bag with the Loot Tokens near the supply box. 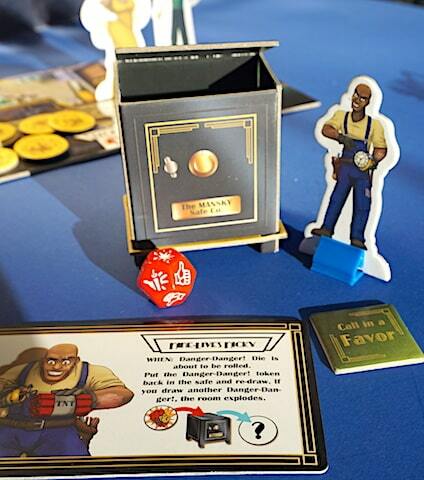 Give each player a random Character card, the matching Character pawn, two plastic stands of the same color, an empty Stash bag, and a Favor Token. 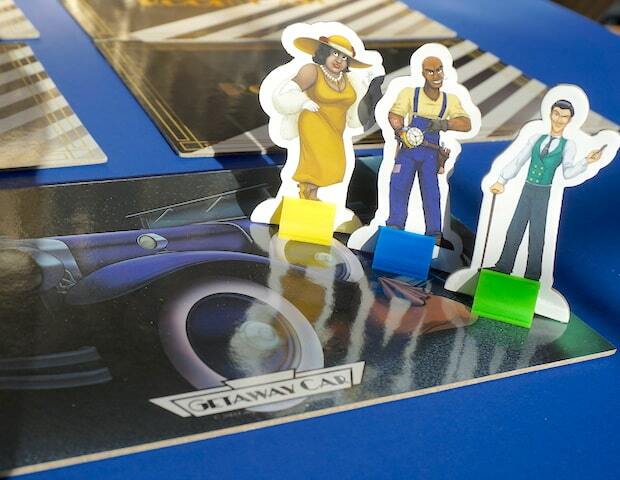 Put all pawns (with stands) on the Getaway Car. Use this opportunity to introduce your Characters and their abilities to each other. You’ll need each other’s special abilities to survive with the most Loot. Players pick two Rooms to “unlock” at the beginning. Flip the Room card face up and load the Safe with tokens matching the type and count shown in the title bar at the bottom. Randomly draw the Loot Tokens from the Loot Bag and load the safe without looking at them. It is the youngest player’s turn and play proceeds clockwise. The Caper is on! On your turn you can choose to Loot a Safe in the Room you’re in or in another unlocked Room. Alternately, you can head to the Getaway car to stash your Loot. Hope you get something good! To Loot a Safe, reach inside without looking and pull out a Token. 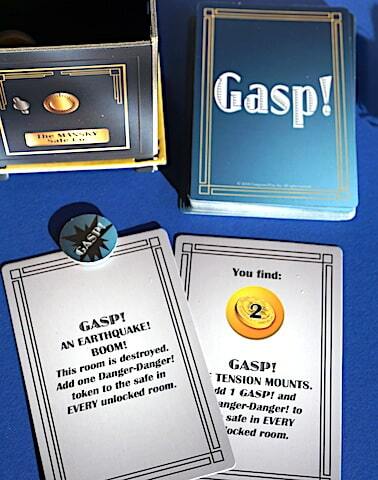 This Token could be a Loot, GASP!, or Danger-Danger Token. Loot Tokens could be keys, coins, and/or gems. You keep keys if you get one; this will allow you to unlock another Room. If the Token is coins and/or gems, divide this Loot evenly between all Characters in the Room. Leftover Loot is left on the floor. Whenever someone leaves a Room, all remaining Characters in the Room distribute the leftover Loot. If you’re the last one in the Room, you get it all! A GASP! Token is a plot twist: sometimes good, sometimes bad. Draw a GASP! Card and follow the instructions. A Danger-Danger Token is a trap! Place the Token on the upper left of the Room board. If it is the last token slot available, the Room is immediately destroyed, and all Characters in that Room return to the Getaway Car! If it isn’t the last spot, you must roll the Danger-Danger die. You could defuse the bomb, lose your unstashed loot, lose the unstashed loot of everyone in the room, or blow up the room! There’s even a chance Al Mansky himself can show up and everyone in the game will lose their unstashed loot! If you have a lot of unstashed Loot and don’t want to risk opening another safe, you can use your turn to head to the Getaway Car to stash your Loot. Place your unstashed Loot inside your Stash bag, where it will remain safe. Each Character has a special ability. These abilities do various things like reducing risk when looting a Safe, doubling the Loot when looting, and more. The trick to these abilities is that you cannot use them on yourself. Instead, each player begins the game with a Favor Token. The only way to get Loot out of a player’s stash bag is using the Hey, Buddy! Move. When two Characters are at the Getaway Car at the same time, one of them can permanently discard a Favor Token to have both players empty their stash bags and divide their Loot evenly. The player who had Hey Buddy! called on them gets to keep the extra Loot. The game ends when all the Rooms are destroyed, or when all Characters return to the Getaway Car and unanimously decide to leave. Everyone counts the Loot in their stash bags. Gems are worth 5 Loot, coins are worth 1 Loot, and remaining keys are worth 3 Loot. The Character with the most Loot wins! There are certain things about The Mansky Caper you must keep in mind when playing to maximize your experience. What will you pull this time? 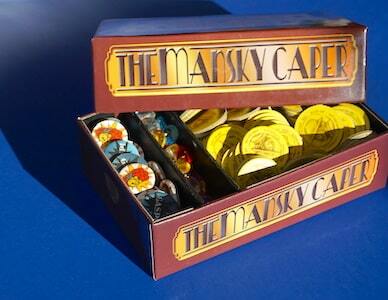 First, The Mansky Caper is a push your luck/luck of the draw game. If you, or some of the players in your game group really do not like games that rely on luck, this might not be the game for you. We have one gamer in our game group who loves strategy, but hates luck and co-operative games, and really didn’t enjoy his time with this one. Second, the more “in character” you’re willing to get, the more fun you’ll have with The Mansky Caper. We’ve played a number of times with our kids, and they love my sassy Southern Belle accent (Note: this review is written by dad). Carrying on with a generically Italian accent can be lost on our children, but embracing Italian characters in movies they’ve seen garners the best responses. Family play with The Mansky Caper is one of the ways it really shines with us. The game is rated 8+, but the core mechanic is press-your-luck, and the effects of the Danger-Danger die are so bombastic we can all have a good laugh. The Mansky Caper is a game about having fun more than it is a game about winning. It is very much a “It’s not the destination, but the journey” kind of game with a lot of social interaction, a lot of laughs, and a lot of fun. Where The Mansky Caper is light on mechanics, it is heavy on theme. We love this game for that reason, and we look forward to revisiting our Italian family soon. Find your own Italian family on Amazon! 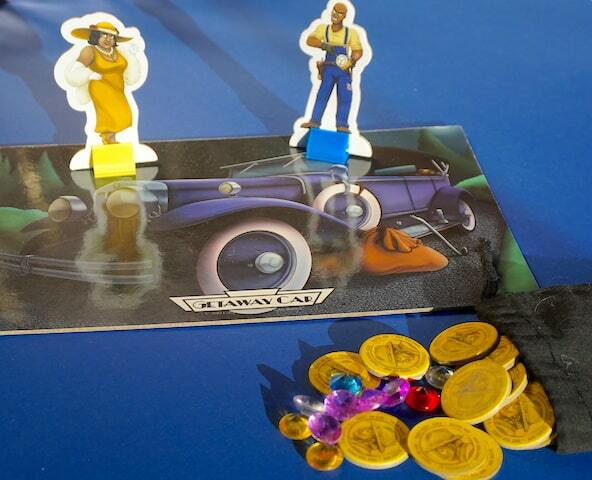 The Family Gamers received a promotional copy of The Mansky Caper for review but also bought an additional copy.